On this trip to Hawaii I had a “bucket list”, and on the top of this bucket list was a visit to my favourite beach on the North Shore, the beach is at Pupukea. The first time I visited the north shore was in the month of June. I was expecting to see the huge surfing waves that I had seen many times on the tv back in Australia. Imagine my surprise when I saw Waimea bay for the first time. People were diving off the big rock into the smooth mill-pond type water. There were no big waves at all, not even a swell. When I lived in Honolulu and house guests stayed with me a special day out was to take them for a drive around the island. Of course, Waimea Bay, Sunset Beach and Haleiwa were regular stops. Situated between Sunset Beach and Waimea is Pupukea which is about an hour drive from Waikiki. 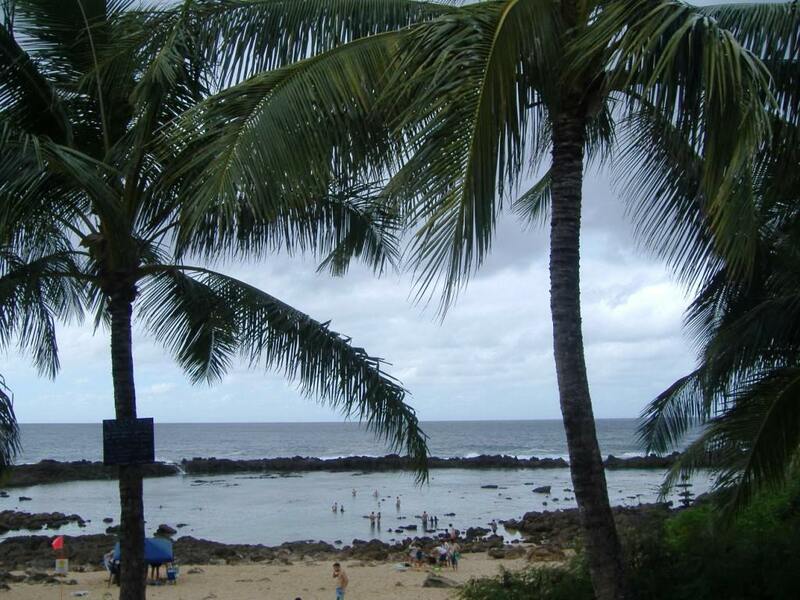 Pupukea Beach Park is a marine life conservation area with several great spots to play. I have spent many good times on Pupukea beach. Lounging on the beach is always popular but my favourite activity is exploring the rock pools and many times I have donned snorkelling gear and lost myself in the beauty of the water and all its hidden treasures. This place is a hidden gem. The water is so clear and there are plenty of fish, live coral and other creatures to see. The water is very calm and reasonably safe so you don’t need to be a great swimmer like at other snorkelling locations. There are restroom facilities with showers, so it is easy to change in and out of swim clothes . There is also plenty of parking up the top from the beach either on the side of the road (Kamehameha Hwy) or in a parking area. Be sure to take swimming shoes because the rocks are very sharp. It would be very difficult to walk across the rocks bare footed to reach the actual swimming area. There is also a tide pool area good for little kids. You could easily spend a full day here. There are not many places to eat at Pupukea but it is not far to drive to Haleiwa, Sunset or Waimea. There is a Foodland supermarket across the highway from the beach. The drive to the north shore is interesting with many spectacular sights along the way. There are several ways you can go. We drove from Kailua however from Waikiki driving along the coast around past Diamond Head, Koko Head, Hanuama Bay is very scenic. 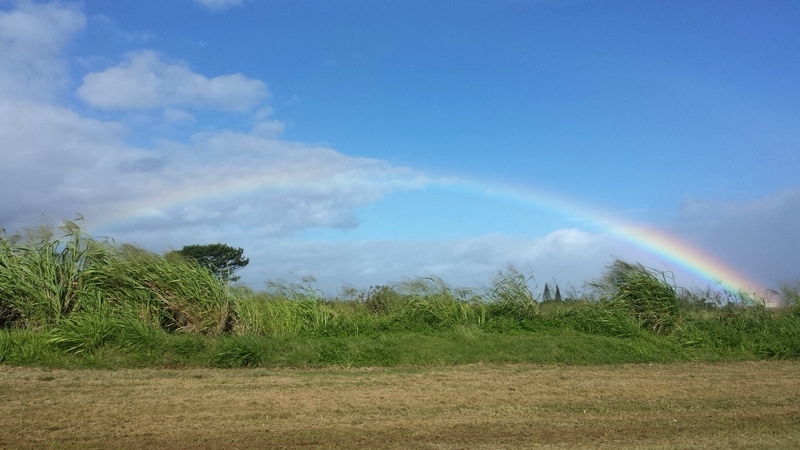 As with most days here in Hawaii I saw many beautiful rainbows while driving out to the north shore and this day was no exception. Pupukea beach is truly heavenly. You’ve captured the essence of the North Shore very well – glad you had a fabulous time as I did! 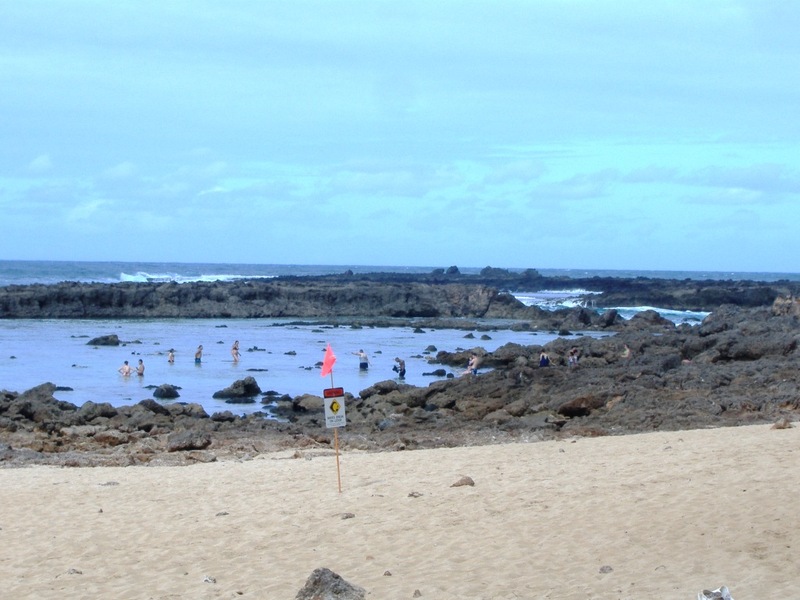 Pupukea is a wonderful place for amateur snorkelers too. Lyn, thank you for taking me to Pupukea Beach! I needed a virtual visit to Oahu! My fave island. Nice post and photos! Thanks once again for the fabulous photo’s and info on such a beautiful place. Lyn The Hawaiian islands have a uniqueness which evokes an essence of friendliness, natural beauty and an enjoyable ambience. You have captured this well with your photos and descriptives. Thank you.